Liu Yongtan, an academician of the Chinese Academy of Sciences and the Chinese Academy of Engineering (CAE), is from the Harbin Institute of Technology, and Qian Qihu, a CAE academician, is from the Army Engineering University of the People's Liberation Army. 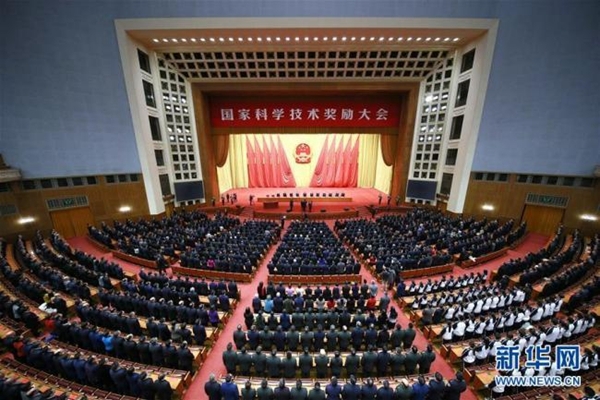 Other leaders, including Li Keqiang, Wang Huning, and Han Zheng, all members of the Standing Committee of the Political Bureau of the CPC Central Committee, were also present. Tuesday's ceremony honored 278 projects, with 38 winning the State Natural Science Award, 67 the State Technological Invention Award, and 173 the State Scientific and Technological Progress Award. On behalf of the CPC Central Committee and the State Council, Premier Li Keqiang extended congratulations to the award winners and thanked foreign experts for their support to China's science and technology development. Li said China has achieved remarkable progress in science and technology since the country's reform and opening-up four decades ago, and the past year again witnessed excellent performance in science and technology innovation. He called on scientific and technological workers to follow the guidance of the Xi Jinping Thought on Socialism with Chinese Characteristics for a New Era, grasp the new trend of science, technology revolutions and industrial transformation, and further implement the innovation-driven development strategy, so as to speed up the building of an innovative country and a leading power in science and technology. Basic research should be given more priority, and receive more long-term and stable support, Li said, adding that the development of basic research, applied research, and industrialization should be integrated to build an open, coordinated and efficient research platform. "We should deepen the reform on the scientific and technological system, innovate the scientific and technological investment policy and the fund management system, as well as expand the decision-making rights of scientists and researchers in choosing technological routes, utilizing funds, and transforming their research achievements," Li said, while urging for the more flexible and diversified payment incentives. He stressed the need to strengthen the role of enterprises as the main players of innovation and the integration of industries, universities and research institutes, noting that more market-driven means should be applied to encourage entrepreneurship. China will step up building the system for IPR creation, protection, application and services, and cracking down on IPR infringement and counterfeiting, Li pledged. Vice Premier Han Zheng presided over the ceremony, which was attended by about 3,300 people. Before the ceremony, Xi and other leaders met with representatives of the winners.